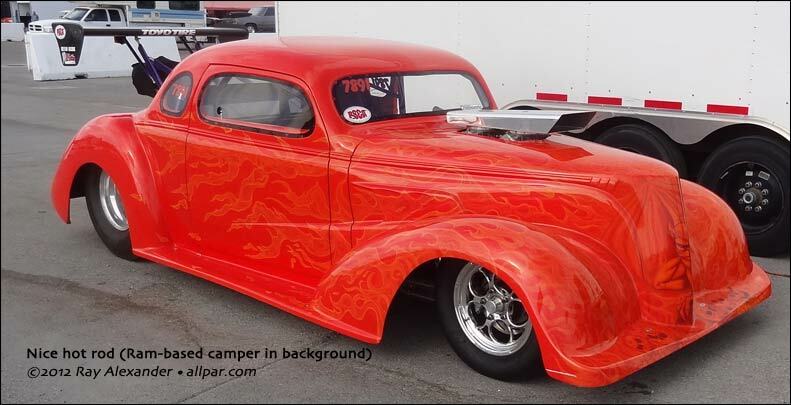 This was the tenth anniversary for what might be the biggest and most popular Mopar event in the West. 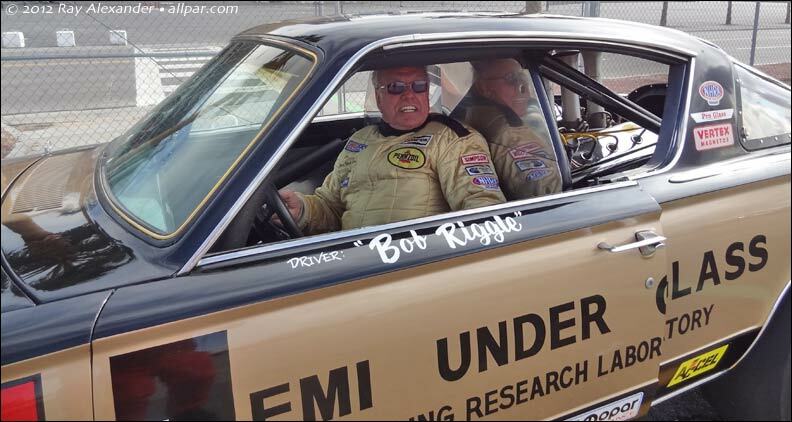 There are 15 classes for drag racing; surely you can find one that meets your needs, with decent prize money. I have been wrong before, but the attendance seemed to be down slightly from last year. 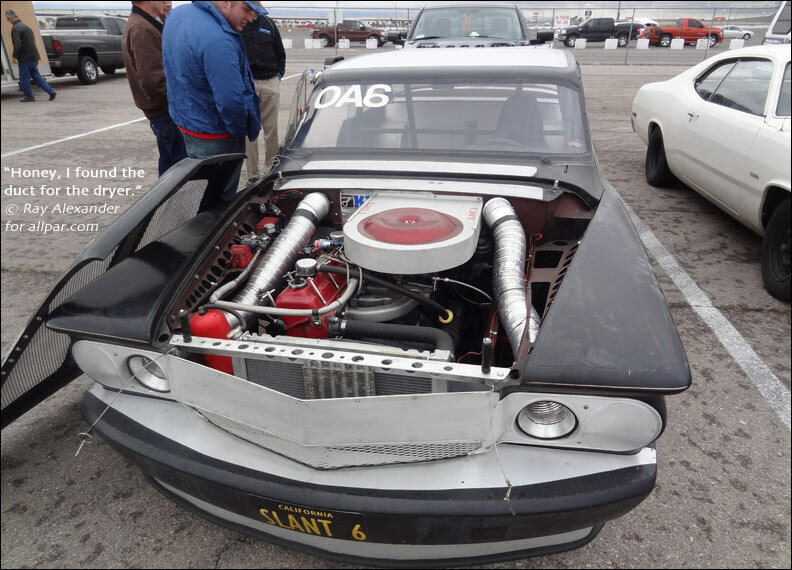 The drag strip is located in a motorsports complex just off I-15, north of Las Vegas, along with the Las Vegas Motor Speedway and other motor racing venues. Training for rookie drivers in the Silver State open road race takes place at this facility, and the last show for Pass Time was filmed at this strip. While the days can be long, depending on weather and how many people lay oil on the track, you are always close to all that Las Vegas has to offer. There were several vendors present; Indy and Hotchkiss are two that almost everyone recognizes, but their product displays were very different. Indy has a semi-load of Mopar heads and engines while Hotchkiss had more stuff for Camaros or Mustangs than for Mopars. Hotchkiss had their contingent of autocross vehicles and offered free rides to race participants, but by the time I decided to do it, they were closed; they did have an ACR Durango that looked as if it were doing well, it certainly sounded good. I don’t attend car shows, but if you came here, you would not waste time looking at other brands of vehicles. You would see 50 year-old Mopars with a trunk full of micro-fiber towels and not a speck of dirt on the car. 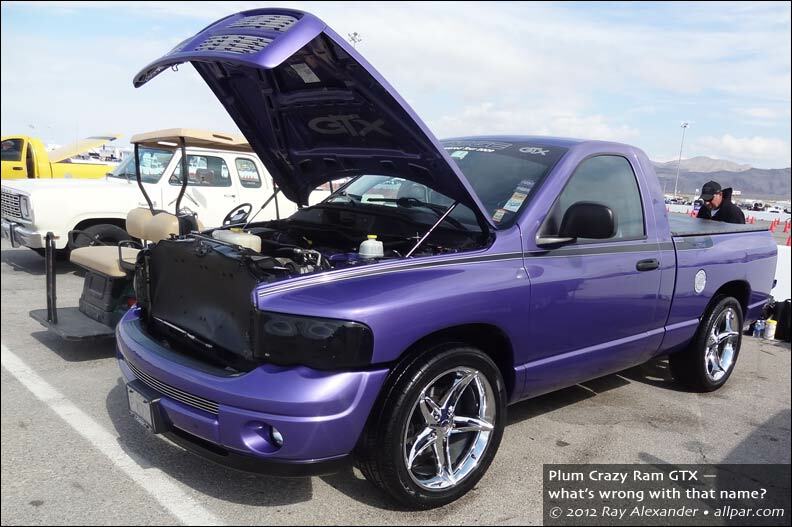 You just might learn some things, for instance, I never knew there was a Plum Crazy Ram. 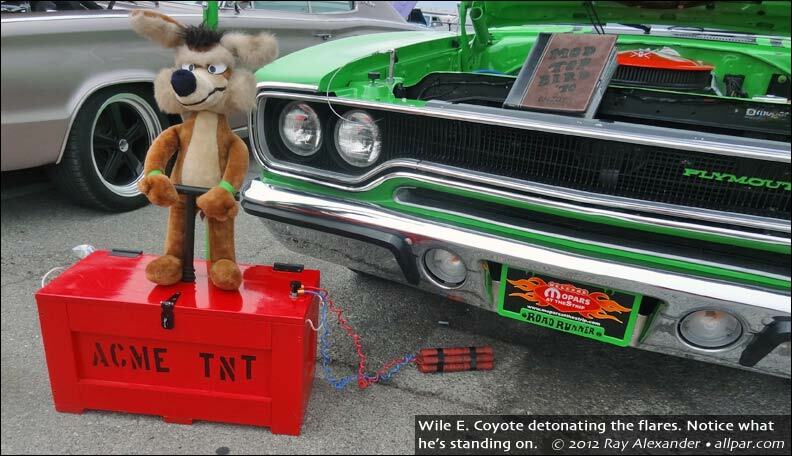 The car show display that I liked best was a Road Runner with Wile E. Coyote having a plunger detonator connector to several sticks of dynamite under the car. I carefully checked the dynamite, which turned out to be emergency highway flares. There was also a swap meet for used parts; some of these parts have seen a lot of use. One guy must have 50 sets of valve covers for the old small block V8 engines. My question, how many lifetimes will be needed to sell that many leaky sheet-metal vessels? 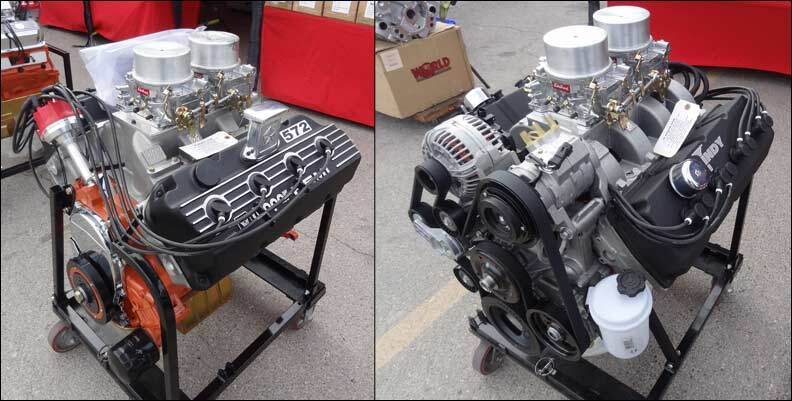 One racer saved his weekend by buying parts at the swap meet. He went on to set a new national record for the slant-six. Friday and Saturday were dedicated to getting every participant four test runs on the track. It was noted on the pass cards that there was no guarantee on the actual number of passes you would get. Saturday morning, everyone awoke to rain. We can’t handle rain. Several classes got only one run that day and were told to be ready to run at eight tomorrow morning. Notice the words “ready to run” and understand the impact. It started to rain again almost as soon as we left the track. Sunday was forecast to be sunny but at 10:00 pm on Saturday it was still raining. I was up at least once an hour. It was wet every time I looked outside. Adam Montague’s Spankin’ Time Machines were going to be featured in a publication and was to do a photo shoot; Adam wanted the four cars from Mopar Syndicate to be included with the three that he had brought. The shoot was done on Sunday and concluded shortly before our class was called. It took a lot of time getting these cars positioned to the satisfaction of the photographer. When you see it, you will think a bunch of drunks parked those cars. An interesting car that I took some photos of was a slant six Lancer. Household clothes dryer tubing was routed from two empty headlight receptacles to the firewall, behind the firewall a box forced the air to reverse direction into the carburetor. The owner related that this change netted him .1 of a second at Irwindale. The downside, lint from the dryer got all over the house. 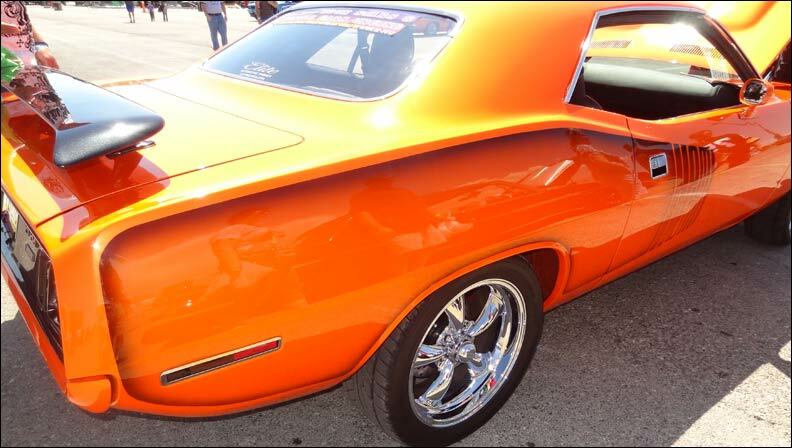 Adam Montague’s beautiful Hemi Orange Challenger won the Pony Car Wars class, or maybe it was Adam who won. He had to run the car seventeen passes on Sunday. The car was brutally hot for the last three passes. I had the pleasure of running against one the cars Adam prepared, it beat me badly even with spotting me .4 L in displacement. I have just returned from Big Bend Open Road Race where I had showed a friend of mine, who races a Viper, the pictures from MATS. He vowed to meet me there next year. If you even remotely like Mopars, old or new, this event should be attended. My friend was trying to order a new Viper but refused to deposit money without a delivery date and a price. One side of this business equation had sound financial reasoning. I was told that I could get class result from the timing booth. As the classes worked toward their final eliminations I went to the booth; classes that had finished were being paid. I was then told it would be at least three hours for results, but that results will be posted on the MATS web site; I have not seen them. So, I am a little curious, were they paying these people without really being positive that they finished in the money in their class? This is Vegas and I would lay money at low odds that the answer is no. So, if you fell into that larger group, like me, that didn’t win class money, you know who you are. If a check was placed in your hand you also know who you are. There you go, results by Ray.